There’s a tool I’ve used for a long time but never mentioned before. It’s called Fission from Rogue Amoeba. You know I’m a huge fan of Audio Hijack from Rogue Amoeba and that I couldn’t do the podcast nearly as well without it. Fission has been a minor player in my workflow, but I just figured out something it could do that might make you happy. 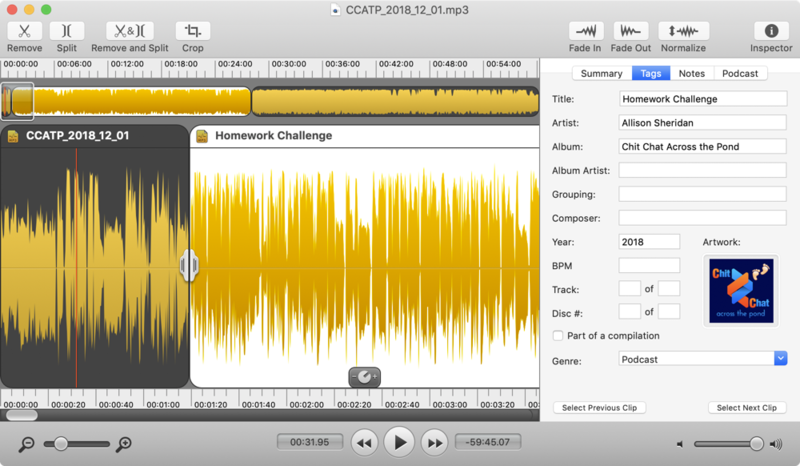 Fission is an audio editing application. It is not a digital audio workstation or DAW, meaning you can’t edit and assemble multi-track audio with it. I really wish Rogue Amoeba would write a DAW, but they haven’t done that. Because Fission only edits one track at a time, its value to me has been fairly limited. But Fission does something that most editors don’t, and that’s losslessly edit audio. When I create the podcast audio, I record in AIFF format, which is an uncompressed format. I use Hindenburg to assemble the tracks, export to m4a and then compress to mp3 with the artwork. You don’t want me re-compressing that mp3 or the audio quality would go down. Fission allows you to edit an mp3 (or other formats) without recompressing the audio. I rarely need to do this, but once in a while I’ve completely finished my workflow and noticed there’s a gap in the audio or some bit I’d like to cut out. Rather than going back to Hindenburg, and re-running all of the steps, I might just open it up in Fission to do the edit. When you cut a section out of a recording using Fission, you can have it automatically fade in and out at the cut point so you don’t get a harsh clip at the cut. It’s very intuitive to use. You can even use it to normalize your audio. Normalizing increase the gain of the selected audio so that the loudest sample is set at the maximum possible value. This is all done without distortion because these folks know audio. You may never create audio yourself, but I guarantee you’d appreciate this small effort by those who do. 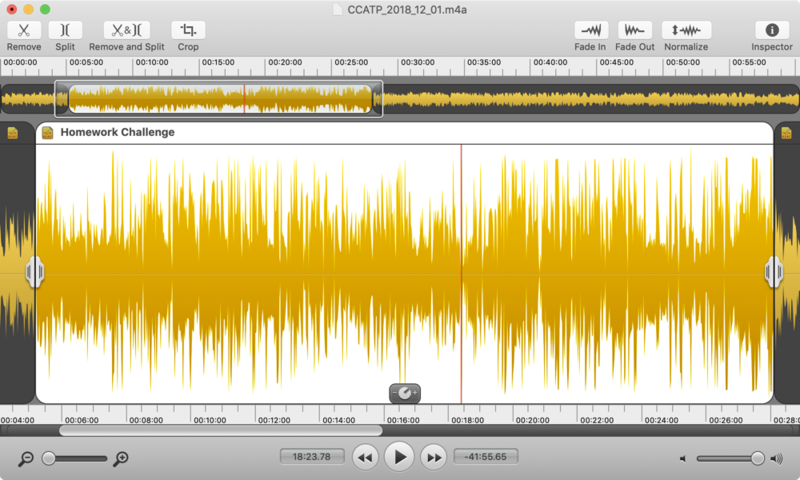 I also find Fission to be the quickest way for me to look at a test recording to see if the audio levels are pretty close between me and my guest on Chit Chat Across the Pond. I run a test recording every single time I do an interview. Even if I’ve recorded an hour ago with the same person, I run the test again because audio is just weird and seems to go bad all by itself. Dropping the test recording onto Fission and taking a quick visual and hearing look at it takes just a few seconds but can save me from catastrophe. 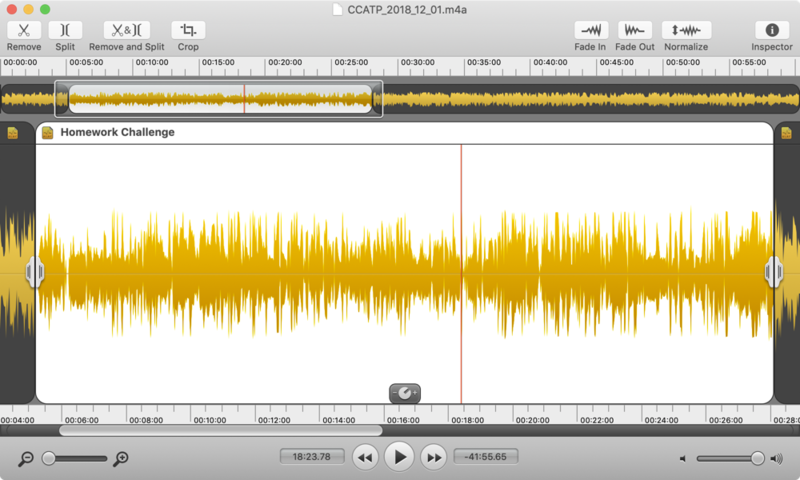 For a long time, I’ve known that you could add splits to an audio file. I never saw the value of it though because it actually caused problems for me. If you split the audio when you export it creates multiple files. That’s the last thing I want in producing a podcast episode. But this week I had a brain fart that turned into an awesome discovery. While I already do chapter marks in the NosillaCast, I haven’t been doing them in Programming By Stealth or Chit Chat Across the Pond Lite. There’s really no obvious spot for them in Chit Chat but it occurred to me that it would be very helpful in Programming By Stealth. You see we always start with some idle jibber jabber, then we talk about the previous week’s homework challenge. Then we talk about the new material. It seemed to me that it would be helpful to be able to jump to the new material if you liked. In a moment of recklessness, I simply announced during this week’s Programming By Stealth that I was going to start doing just those three chapters. The reason it was reckless was that I completely forgot that there was a really good reason I don’t already do chapter marks in the non-NosillaCast episodes. It’s because I use the desktop-version of Auphonic level which strips off the chapter marks. For the NosillaCast, I use the web-based version that preserves them, but it’s quite costly. As I was starting to write up the show notes for Programming By Stealth, I realized that I couldn’t come through with my promise. For some reason, a little elf in my brain said, “Fission does lossless editing, maybe it can do chapters?” Well, sure enough, it can! Remember I mentioned you can split the audio file? Well if you do, you can enter tags for each split point which gives a title, a URL and even artwork if you’re so inclined. But remember the problem that it creates multiple files? Turns out under File, there’s an option to Save As Chapterized MP3 or AAC. I feel like such a dummy for not noticing this sooner. Rogue Amoeba has fabulous documentation on their software products, and while I’ve read the one for Audio Hijack from cover to cover, I never took the time to read the one for Fission. I tested out doing the chapter marks for this week’s Programming By Stealth and sure enough, it worked! I’m thrilled to have such an easy and intuitive way to do this for you guys, using a tool that’s been sitting right in front of me all this time. Fission is available from Rogue Amoeba for just $29. If you don’t own Audio Hijack yet and you’ve always wanted it, they have a bundle of both for $70, saving you 25%.